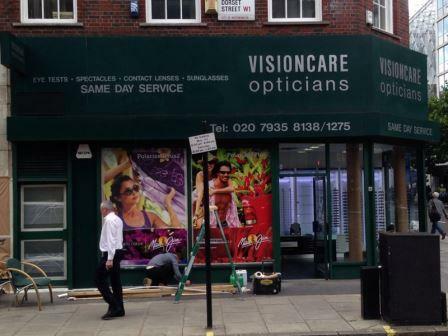 Painting Retail Fascias and Signage. Labelling a shop front with a sign outside is nothing new, but making sure yours is the best it could be to attract the optimum number of customers takes skill. After a while these information boards may deteriorate or become outdated, so knowing why and when painting retail fascias and signage is best makes good business sense. Fascias are thin metal, plastic or wooden boards that are attached horizontally along a building under guttering. These vertical friezes sit under the edge of the roof normally, though they may run above ground floor windows and doors on a multi-storey building. Covering timber or brickwork, they protect air vents leading into the interior roof space and comprise the backing surface for signs. Signage is the term used for a graphic display designed to convey a message to the public. It indicates what type of retail outlet is inside a building by focusing attention on the company and highlighting a brand. Signs and fascias are found on all types of organisations from small local businesses, large stores in retail parks and on the high street, educational facilities, health centres and offices. They come in all sorts of shapes and sizes and an array of styles. Signage can be manufactured in a range of materials including aluminium, stainless steel, acrylic and vinyl. Any of these substances can degenerate over time, so recoating them may be necessary as part of a maintenance programme. Environmental forces wreaks havoc on any metalwork and signage and fascias are particularly prone to weathering because they are so exposed. Surfaces get blasted with wind and rain and colours fade in the face of ultra violet rays. There may also be mildew marks on the finish. It is not just weathering that takes its toll on a fascia or sign, the original coating may be inferior. A low quality coating may not last as long as it should or the substrate might not have been prepared properly. Paint that has suffered water damage or has been laid down over a badly prepared surface might peel or blister up. Whatever the reason for deterioration, peeling paint on a fascia looks unattractive, so smartening these surfaces up can make an enormous difference to how the exterior of a shop looks. First impressions are everything and even if fascias and signs are in good condition, the style and colour may be wrong. Consequently, a colour change may be necessary for re-branding purposes or simply to modernise the frontage of a commercial property. The colour choice and design needs to represent the retail outlet in a positive light and should be a reflection of the type of company inside the building. Whatever the reason for recoating fascias and signage it is worth remembering that a re-spray is more cost effective than having a new sign designed and manufactured, but it does need to be done correctly. Using an experienced onsite paint spraying company to do the work is a wise investment because they will know how to prepare the substrate properly, how to protect adjacent areas from overspray and be qualified to work at height. A professional sprayer will also be adept at using different spray techniques such as electrostatic and HVLP systems which are the most appropriate methods where recoating intricate lettering and symbols are involved. For painting retail fascias and signage the best finishes should be applied to metallic surfaces over the most suitable primer. Signage needs to be highly visible and durable to survive extreme weather conditions, so investing in high quality materials is always worthwhile.